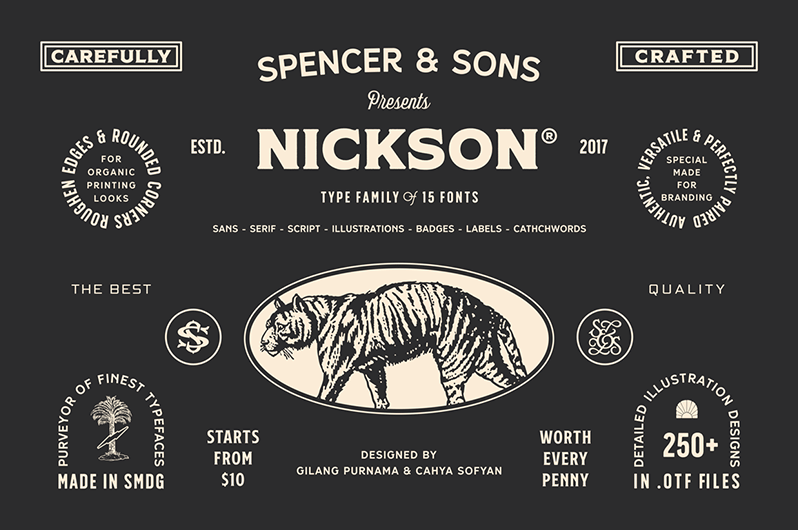 Ad by Spencer & Sons Co.
S&S Nickson One à € by Spencer & Sons Co.
Nickson Font Family includes 15 fonts that have different styles from each other but at the same time perfectly paired when used together. Nickson offers seven display fonts, one script font, 250+ illustrations (using new techniques so you will not lose every detail), badges, labels, and catchwords. Nickson Font Family Collection was designed carefully to create elegant typographic works. It would be a perfect choice to design posters, affiches, logos, t-shirt and magazine prints, eye-pleasing typographic designs and more. If you require an upgraded license please contact me. Upgraded licenses are required for web fonts, apps, ebooks, broadcast television, commercial exhibition, film, gaming, software embedding, customized print on demand products, etc. Illustration © Spencer & Sons Co.